First, How do you get it in your bathroom? One piece units often don’t fit into existing bathrooms. Often a wall or door frame must be removed, adding to the over-all installation cost, time, and upheaval to your daily routine. One piece units don’t allow for customization. Windows become a costly problem. Shower pans are very often unusual sizes or shapes. Often the drain is located in the wrong place for a one piece unit to work. The location of grab bars, fixtures, etc. are harder to find where you want them, because you can’t change their location. Customizing your shower with Best Fit Bath allows you to get what you need where you need it. Windows, drains, grab bars, etc. will be placed around YOUR design goals! 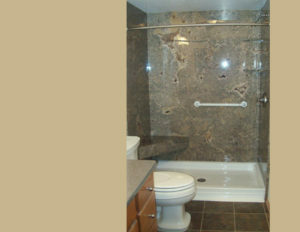 Even with the simple shower shown above, the best option was a customized shower remodel. Best-Fit Bath can design and install the tub or shower YOU NEED in your home! We consider everything; size and space, plumbing, possible problems of water damage, mold issues, and fixtures. We also offer a whole range of design colors and styles to customize your bathroom instead of having to settle for a one-piece unit. Call us today for a free quote!